India’s growing economic might and the newfound spending power of its citizens appear to be fueling new demand for private education delivered in English. That’s a takeaway from a new report put forward by ISC Research, a British organization that studies the global education market. There are currently 469 international schools in India serving 270,000 students ages 3-18, according to the analysis by ISC Research. The number of international schools in the south Asian nation, the world’s second most populous country with 1.3 billion residents, has grown by about 45 percent over the past five years. The British research firm says that international schools are on the “cusp of a significant expansion” in the near term, pushed along by a number of factors. One is that India’s population of young people continues to grow rapidly. Twenty-eight percent of its population is younger than 14, according to the ISC. In addition, as India’s economy has continued to expand—a recent estimate put annual GDP growth at 7 percent—it has seen a continued rise in the number of families with money to spend on private education. That same trend is playing out in many growing economies, from China to smaller developing nations. The demand for international schools in India is largely being pushed along by Indian families, not expatriates, according to ISC, and the interest is high, regardless of the level of tuition. ISC researched all international schools in India charging at least $4,000 in U.S. dollars per year. Schools with yearly charges of between $4,000-$10,000 are 79 percent full. Schools charging $10,000 or more are more than 81 percent at capacity, says ISC. The organization says it has been conducting research on international schools for more than 20 years, and that it gathers information from school officials, governments, and its own market research. At India’s “mid-fee-range” international schools—those charging $4,000-$10,000–75 percent of enrollees are local Indian children, ISC says. In international schools charging more than $10,000, 43.5 percent of the students are from Indian families. 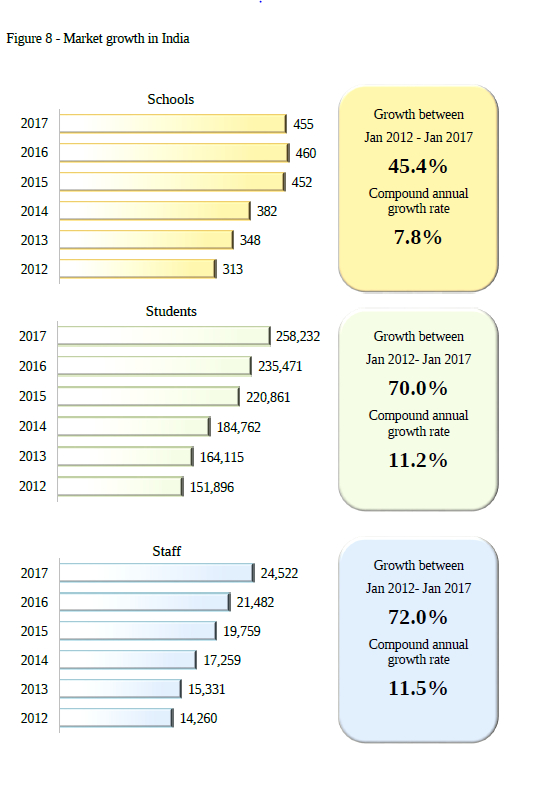 As international schools in India expand, there has been a decline in enrollment at India’s other types of private schools, ISC says. And, meanwhile, there is a growing demand for “global-recognized” curriculum and exams in India. That means more schools are seeking out not only the International Baccalaureate program, but also other curricula used in the United States, England and Canada, as well as well as specific programs such as Montessori and Reggio Emilia, explained Richard Gaskell, ISC schools director, in an e-mail. A number of private organizations from around the world, including not only those from Britain but also from Canada, have already established operations in India to try to capitalize on the international school market, the British research organization says. While ISC provided some details on its analysis to Marketplace K-12 for this post, the organization’s full, 117-page report on India is available at a cost.